In the past weekend, our group met in the Lužnice field station of the Institute of Botany of the Czech Academy of Sciences. We were joined by a few close collaborators working on our current and future projects. 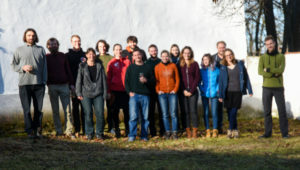 During both days we had enough time to discuss the progress and future plans, this time specifically focused on our pollination projects in the Afrotropics, as well as on Afrotropical butterflies and moths. Since we were all together, we celebrated the grants which our group has received recently. It was a successful and enjoyable meeting and we are looking forward to what 2018 will bring to our group!